The October, 1977 performance of the fan favourite is the only known studio recording of the fast version, captured during the sixth and final session for the BBC. "'We Will Rock You' – profundity or just another teenage anthem!?" remarked BBC DJ John Peel upon airing the song in 1977. "I've never seen them live. I must admit I'd like to – a band that sounds like nutters, actually, and I like that because I like rock music to sound a little out of control." 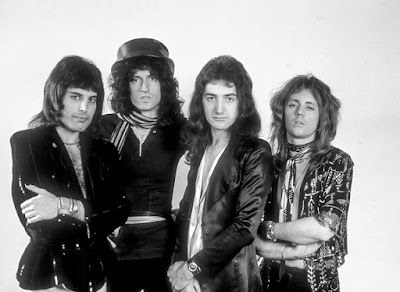 The 2CD or 3LP set of “Queen On Air” presents twenty-four recordings by the group between between February 1973 and October 1977, and includes include alternate versions of the band’s debut single, 1973’s “Keep Yourself Alive”, among others. A 6-CD Deluxe Edition box set adds radio interviews and live concert broadcasts from 1973, 1981 and 1986, as well as a booklet of rare photographs and sleeve notes compiled by Queen archivist Greg Brooks, featuring memories from the band and BBC producers Jeff Griffin and Bernie Andrews, plus comments from legendary Radio 1 DJs John Peel and Bob Harris from the time of the original broadcasts.